singled off Cleveland pitcher Jose Mesa in the 7th inning, September 9, 1992, to reach the 3,000-hit plateau. 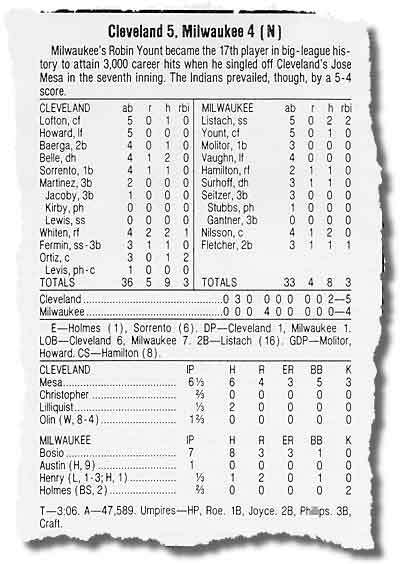 Coincidentally, Yount's 1,000th and 2,000th hits also came against the Indians. At 36 years, 11 months, and 24 days old, Yount was the third youngest member of the 3,000-Hit Club, behind Ty Cobb (34 years, 8 months, 1 day) and Hank Aaron (36 years, 3 months, 12 days). Just three weeks after Yount's historic hit, fellow 1999 Hall of Fame Inductee George Brett joined his friend in the 3,000-Hit Club. © National Baseball Hall of Fame and Museum, Inc.